This is ancient surname is both Scottish and locational. It originates from the former county of Sutherland, so called from the pre 7th century Olde Norse 'suthroen' meaning 'southern', plus 'land'. 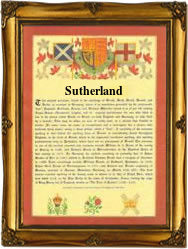 As Sutherland is as far north as one can get in the British Isles, the name seems misplaced, but not so to the Norsemen. Sutherland does lie south east of Scandinavia, and due south of the earlier Norse colonies in the Orkney and Shetland Islands. The surname from this source is first recorded in the early half of the 14th Century, (see below), and early examples include Nicolas of Sothyrland, who had a land charter from his brother, the Earl of Sothyrland, in 1360, whilst a few years later in 1364, Maurice de Sotherland also believed to be a brother of the Earl, was granted leave to travel overland to England during a period of war. Among later interesting recordings are those of Alexander Sutherland, the vicar of Westray, Scotland, in 1441, whilst in May 1770, Forbes Sutherland, an Aberdeenshire sailor, had the posthumous distinction of being the first Briton to be buried on Australian soil. The first recorded spelling of the family name is shown to be that of Davie de Sothirlandae, This is dated 1332 in the rolls known as the 'Register of the Holy Trinity Monastery', Scone. This was during the reign of King David II of Scotland, 1329 - 1371. Surnames became necessary when governments introduced personal taxation. Throughout the centuries, surnames in every country have continued to "develop" often leading to astonishing variants of the original spelling.